No longer available from the manufacturer. 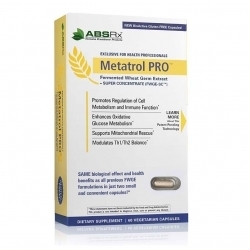 Please see MetatrolPRO, the new capsule form. Note, if you have trouble swallowing capsules, the capsule may be opened and sprinkled on food. New Avé ULTRA Freeze-Dried Concentrate - with 99% less non-active ingredients! Please choose Avemar 2-day UPS (refrigerator pack) shipping option when checking out. AvéULTRA is shipped on Monday, Tuesday, and Wednesday only so that it is not in transit over the weekend. Avé should not be exposed to heat over 80 degrees F. The US shipping charge is $19, no matter how much you order. When checking out, please be sure to enter the billing address where you receive your credit card statement and provide a ship-to address where someone will be available to receive the package. Referred to as H-86 by Health Sciences Institute. Other items ordered on the same order may be shipped separately. Overnight shipping may be available at a higher cost. Please call us at 888-73-REJUV (888-737-3588) for arrangements. The development of Avemar fermented wheat germ extract has become the life's work of Dr. Hidvegi. He was inspired to build upon the theories and experiments of Hungarian Nobel Prize Laureate, Dr. Albert Szent-Gyorgyi. Dr. Hidvegi's patented processes yield a consistently effective standardized extract that has been extensively researched. Avemar has been the subject of over 100 studies in cell lines, with animals and clinical trials, reporting in more than two dozen articles in medical peer-reviewed journals. ** Subjects in clinical trials consumed 8.5 g per day of Avemar pulvis, consisting of 5.5g Avemar fermented wheat germ actives with 3g maltodextrin, a non-active stabilizer. Each packet of AvéULTRA contains 5.5 g Avemar fermented wheat germ actives, without maltodextrin. More info on Avemar for Immune System Support. Avemar's development was inspired by the work of Hungarian scientist Dr. Albert Szent-Gyorgyi, awarded the 1937 Nobel Prize in Medicine for describing the essential role of vitamin C in the life-sustaining processes of cellular metabolism. Dr. Szent-Gyorgyi recognized that methoxy-substituted benzoquinones play essential roles in regulating and fine tuning metabolism at the cellular level and theorized that supplemental levels of methoxy-substituted benzoquinones could help the body respond to internal and external stresses. In recent years, a new generation of Hungarian scientists has continued Dr. Szent-Gyorgyi's work in developing a method of manufacturing an all-natural and standardized source of methoxy-substituted benzoquinones by fermenting wheat germ with baker's yeast through a patented process. (U.S. Patent #6,355,474). This product is now available as a dietary supplement in a once-a-day, pleasant tasting instant drink mix, and is being studied in hospitals and recommended by doctors around the world. It is available in the U.S. under the brand name AvéULTRA, and as Avemar outside the U.S. Product of USA. Distributed by American BioSciences, Inc. 560 Bradley Parkway, Blauvelt, NY 10913. Phone: 888-884-7770 (845-727-0800).